Almonds depend on bees and bees depend on almonds. In fact, the link between bees and almonds is so important that the relationships between almond growers and their beekeepers often go back years or even generations. Between February and March each year, almond tree buds burst into beautiful light pink and white blooms in preparation for pollination. As the trees blossom, honey bees forage for pollen and nectar in the orchard. When the bees move from tree to tree, they pollinate almond blossoms along the way. Each fertilized flower will grow into an almond. After almonds, beekeepers bring their honey bees to different locations across the United States, pollinating more than 90 other crops and making honey. Almond orchards provide honey bees with their first natural source of food each spring. Just like almonds are a nutritious snack for us, almond pollen is very nutritious for honey bees. Honey bee hives routinely leave stronger after visiting during almond bloom. Beekeepers can then split many of the hives to grow their apiaries. A variety of factors have led to a widely documented and concerning decline in honey bee health, including activities associated with both beekeeping and crop production, putting at risk many of the foods we count on for a stable, nutritious food supply. While the total number of honey bee hives in the U.S. has remained stable for the past 20 years,2 maintaining healthy, stable hives is beekeepers’ big challenge. That's why Almond Board of California has taken extraordinary steps to be good partners to beekeepers in promoting bee health. We have funded more honey bee health research than any other crop group3 with more than 100 research projects since 1995. 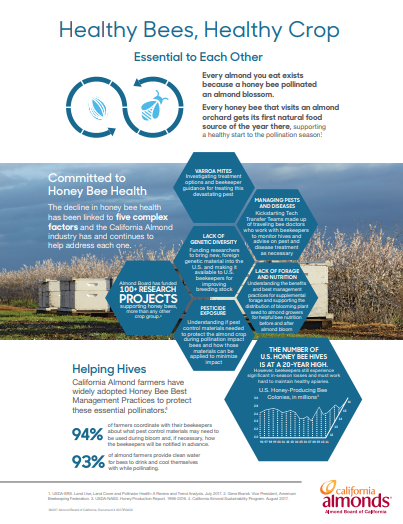 Almond industry-funded research, along with that of other universities, government agencies, and non-profits informed the Honey Bee Best Management Practices (BMPs) for California Almonds. Guidelines for everyone involved in the pollination process, the Honey Bee BMPs provide recommendations ranging from making the orchard a safe and welcoming place for honey bees to how to treat for pests and disease without harming bees. Almond Board encourages almond growers to provide blooming plants or bee pastures adjacent to almond acreage as additional food sources for honey bees prior to and after almond bloom. Beyond providing additional nutrition for honey bees, these plantings may help farmers improve their soil health, water infiltration and more. 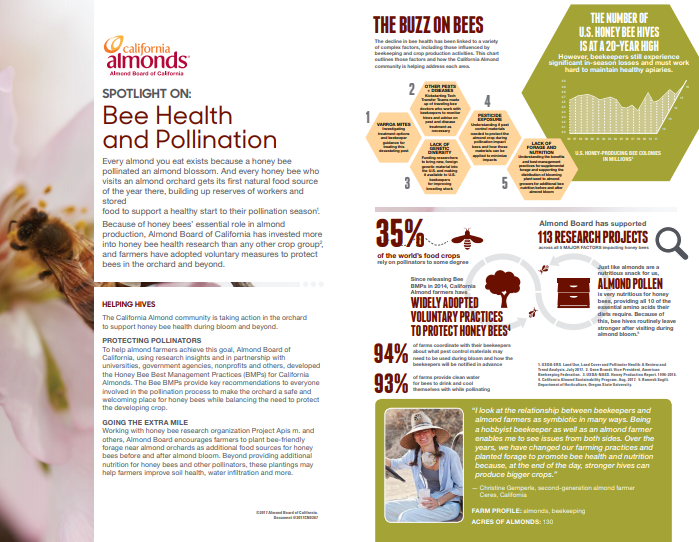 As a result of our commitment to and study of these issues, Almond Board has become a leader in the honey bee health conversation. 1. Ramesh Sagili, Oregon State University, Department of Horticulture. 2. USDA-NASS. Honey Bee Production Report. 1986–2015. 3. Gene Brandi. Vice President, American Beekeeping Federation.